Our community playgroup in Burton on the Wolds has been running for almost 40 years. We can cater for up to 24 children during each session, from the age of 2 to 4+ years. We are open from 9am to 12.00pm on Mondays, Tuesdays, Wednesdays, Thursdays and Fridays during term time. Our aim is to provide a safe, caring, positive and stimulating environment for the children in our care where their individual interests and needs are catered for, to enable them to explore and learn through meaningful play. We aim to nurture and develop their physical, intellectual, emotional and social skills so they become confident, independent, sociable, happy individuals. We have a lovely big bright village hall filled with lots of activities to suit all the children’s interests. Most of our children’s time is spent in freeplay where they choose from the wide variety of activities on offer such as sand play, water play, playdough, puzzles, roleplay, dressing up, building, arts and crafts, and small world play such as the farm or castle or train track. We also run adult led activities alongside the freeplay, often linked to a particular theme for the week, such as baking, planting or a visitor come in to the setting such as a fireman or a bee keeper for example. We also enjoy music and singing everyday, sometimes with musical instruments or the parachute. We have an interesting outdoor area which is well equipped and the children go out to play most days. Going out for walks into the community is a regular part of our week and we often go to visit the local shop, parks or woods. 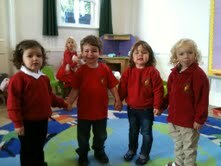 You may already have seen the children in Playgroup T-shirts which are a great way to protect clothes. They are available to purchase at Playgroup if you wish, as are sweaters and fleece jackets. In addition the class one teacher and the head teacher (with his guitar!) from Burton on the Wolds Primary School make regular visits to playgroup to come and play with and get to know the children. You can find further information about Burton on the Wolds Primary School here.